Litcham post windmill stood at Lime Kiln Farm on the north east side of the village. The mill had a roundhouse and ran 2 pairs of stones, one in the head and one in the tail. of the mill. Head and tail wheels were set on a wooden windshaft and the axle tree was 18ins. square at the tail wheel. A Counter Geered Tail WHEEL, six feet high, 3¼ inches pitch & not less than 18 inches square for the axle tree. Any person having a good strong Wheel of this description by sending price and particulars to R. Curtis of Litcham, near Rougham, Norfolk will be immediately attended to; none but post paid letters will be opened. Tithe Award enclosure no. 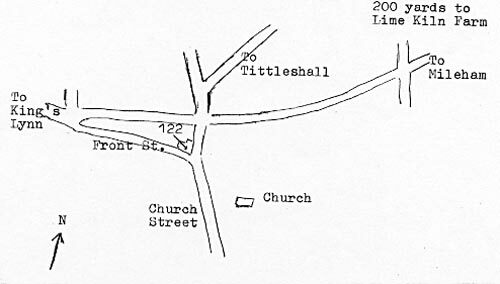 122 was on the corner of the north side of Front Street and the west side of Church Street. In 1842, John Blinkinsop lived and ran his shop from there but by 1973 the buildings had been demolished and the area grassed over. 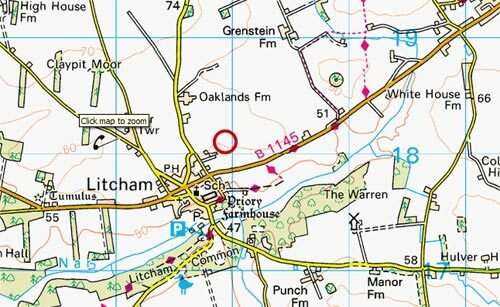 All that valuable FREEHOLD PROPERTY in Litcham called "Lime Kiln Estate" containing 6a. 1r. 9p. or thereabouts upon which is a capital Windmill with Roundhouse in first rate condition, an excellent Lime Kiln, with all the necessary Buildings and appurtenancies thereto, Dwelling house, Cottage, good Barn, Granaries, Stables & Outbuildings near the Lime Kiln. The above Property is Freehold, the land is in a high state of cultivation, the Buildings are in a good state of repair & an old established Trade is attached to the same. Particulars of Messrs. Cooper & Son, Solrs. East Dereham, Mr. Thos. Palmer, Solr. Great Dunham & of the Auctioneers, Mileham & Oxwick. WANTED, a Young Man as MILLER & BAKER. Apply to Mr. E. Bennett, Litcham, Norfolk. On 22nd November 1972, Harry Apling visited Litcham and talked to local residents. Mrs. Gladys Moore and her son Robert, told him that foundations just below the surface interfered with cultivation in the north-east corner of Back Field, Enclosure No. 144 of the Tithe Award map. These were probably the mill foundations, being on the highest ground, just above the 200ft. contour. Mr Ewan of Church Street said that his father had told him there had been a windmill there.